In the age of the internet café and free Wi-Fi at Starbucks, we at Party Earth were wondering, where can you get that old school “I’ll take three hours to drink this artisan latté” experience?We’re talking about the real deal of café culture, the kind of place you could picture Picasso kicking back to enjoy a charcuterie plate and afternoon glass (or bottle) of wine. Obviously any café that could ever come close to offering this much intellectual swagger would be located in Paris. Whether you’re looking for things to do in Paris while pondering the ideas of existentialism, or just want to get tipsy on a quaint side street with European hipsters, the City of Light has a café for you. Looking for a place to spend a quintessentially artsy, quintessentially French night out? Rosa Bonheur, named after the famous free-spirited, pants-wearing Parisian bohemian painter is a hot spot to while away a late night enjoying some delicious sangria in a carefree atmosphere. The café originally opened in 2008, but has only recently gained popularity as a pretension-free hangout spot for hip families, fashionistas, art scenesters and local Parisian hipsters. You can get a bottle of wine for a reasonable price (15 euros! ), and dance the night away in the charming wood-framed café or outside on the lawn. 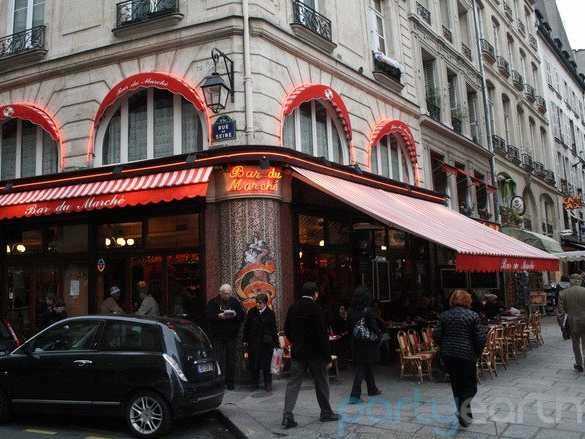 Café Rosa Bonheur is located in the 19th Arrondissement and is accessible through the gates at 7 rue Botzaris. 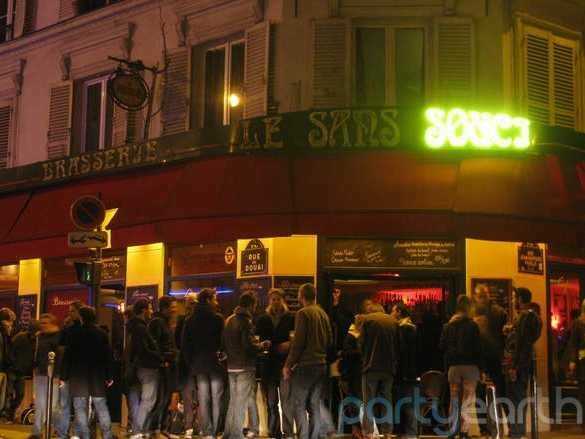 Le Sans Souci is a charming dive bar and café located in the middle of the popular Pigalle section of Paris. The laid-back attitude at Le Sans Souci – which literally means “no worries” in French – makes it the prefect place to enjoy an affordable draft after a long day of work or exploring the city. The crowd here is filled with 20-something professionals, international hipsters and drunken intellectuals who all have one thing in common; they love a tipsy chat in a quirky setting. Le Sans Souci is a popular destination so it’s recommended to get there early if you have your heart set on grabbing a seat indoors. Famous French novelist honouré de Balzac was a regular at the Paris café Au Rocher de Cancale, built in 1846 and popular with locals and foreigners alike ever since. 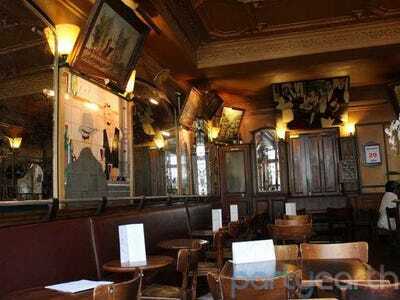 Of all the vintage cafés in Paris, Au Rocher de Cancale has perhaps the most reliably festive vibe and endures as a delicious place to eat, drink or as Balzac did, people watch. There is certainly no lack of diversity in Au Rocher’s patrons; on any given day you can find students, families and working professionals enjoying French salads, seafood and old school steins. Don’t think that this place is only good for an afternoon drink, Au Rocher de Cancale also offers tasty afternoon brunch perfected with liquor-filled chocolates. Nothing says “perfect Parisian afternoon” like the sight of a street-corner café with a red-and-white striped awning, which is just what you’ll find at Le Bar du Marché. This café is known as the epicentre of the “bobo” phenomenon, the mix of classic French bohemian and bourgeoisie culture. The atmosphere of the bar reflects this trend; the dim lighting and vintage jazz posters create a casual lounge vibe while an intellectual crowd fills the outdoor tables enjoying the simple bistro dining options. The Bar du Marché is by all means a hip option; make sure you’re wearing your trendiest smart/casual attire and in the mood for a croque-monsieur. Paris is full of cafés claiming to have started the “café culture,” but few have the credibility of the iconic coffee houses of the Saint Germain. This famous neighbourhood is home to many of Paris’ best-known cafés including La Palette, a favourite of Picasso, Cézanne, and Braque. To this day the café attracts the elite of the creative world, from the students at the famous art school École des Beaux-Arts to Hollywood A-listers looking to relive art’s golden era. This café has truly withstood the test of time and is still popular among tourists and locals alike for its friendly bartenders, artsy atmosphere, and delicious coffee and food.